Unless you’re a competitive athlete, you probably can’t do more than 50 consecutive push-ups (and even the seasoned pros often struggle to finish more than 20), but hundredpushups.com can make anyone feel like a champion. The site claims that everyone, with a little bit of training, can pump through 100 full-press push-ups without pausing to rest. Sound impossible? At Wellness Corporate Solutions we are up to the challenge! 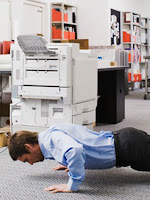 Several days a week, WCS employees gather on the (thankfully carpeted) office floor and sweat through five or six sets of push-ups. Although many of us cannot manage more than several at a time, the rests between sets let our muscles relax and give us time to stretch and prepare for the remaining exercises. Hundredpushups.com claims that following their six week training program will give each and every employee the ability to complete 100 consecutive push-ups. In the world of corporate wellness, it can often be difficult to practice what we preach. Stressful schedules, cold weather, and lack of time, (the usual excuses), all make it hard to find time to exercise and eat right. But this winter, we are making workplace wellness a priority. If there’s one thing we’ve learned over the years, it is how to make wellness fun and exciting for everyone. Some challenges fail to effectively engage the workforce because the expectations are overly demanding, require too much time, or fail to take participant enjoyment into consideration. Although our resident trainers emphasize the importance of good form and breathing correctly, everyone has a smile on their face by the end of the five-minute training. Most importantly, we are being careful. The training is gradual, we are taking our time, and ultimately we will work our way up to 100 consecutive pushups – yes, every single one of us.